The police officers who searched the rapper’s house did so with an illegal search warrant. Young Thug will face no consequences from 2015 drug and gun charges, TMZ reports. In July of 2015 the rapper's home was subject to a raid by police in Sandy Springs, Georgia. The cops found weapons and drugs, and Thug was charged with felony cocaine possession, felony marijuana possession, and 3 counts of felony gun possession. According to TMZ, by Monday the district attorney had dropped all but the marijuana charges. 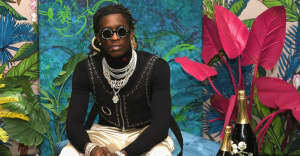 Thug's lawyers then argued that the police searched the rapper's home with an illegal warrant. The court sided with Thug, and all charges against him have been dropped. Young Thug's team did not immediately respond to request for comment.